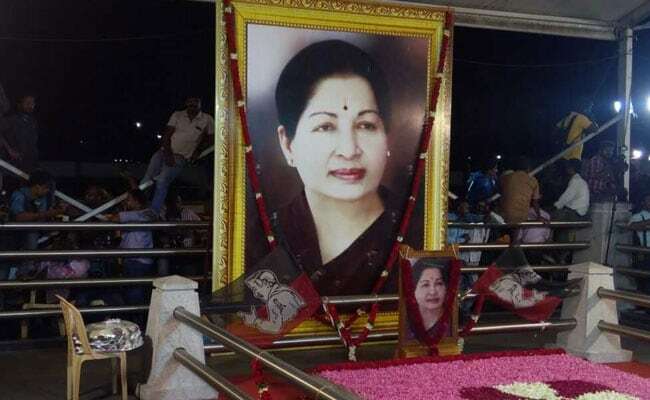 The law minister of Tamil Nadu has alleged that two senior bureaucrats lied about former chief minister J Jayalalithaa's health condition during her treatment in Chennai's Apollo Hospitals in 2016. "Amma would have been alive had she been given proper treatment during her 75-day-hospitalisation," Tamil Nadu Law Minister CV Shanmugam told reporters at Villupuram, 160 km from Chennai. The then health secretary J Radhakrishnan did not allow Ms Jayalalithaa to be taken abroad for advanced treatment and former chief secretary P Rama Mohana Rao gave contradictory statements to a probe commission, Mr Shanmugam said. The law minister demanded a separate investigation by a special police team in addition to the ongoing one by retired judge Justice A Arumughaswamy into the sequence of events before the chief minister died on December 5, 2016. Apollo Hospitals did not perform angiogram -- a procedure for evaluating blockages in the arterial system -- on her despite advice from three doctors for it, the law minister alleged, and sought an early report from Justice Arumughaswamy. "Today, angiogram has become a common treatment. Who ignored angiogram treatment?" Mr Shanmugam said. "Several times, there were suggestions to take Amma (Ms Jayalalithaa) abroad for treatment. Doctors have said this. Central government also offered air ambulance. All these were denied," Mr Shanmugam told reporters at Villupuram, 160 km from Chennai. "Saving a patient's life is important than protecting the reputation of doctors... This government must probe his (Mr Radhakrishnan) background," he said. The Justice Arumughaswamy commission has implicated the two officers following allegations by unnamed sources that Mr Radhakrishnan "colluded and conspired" with Apollo Hospitals and "inappropriate treatment" was provided to Ms Jayalalithaa; it held the then chief secretary responsible for having "purposely given false evidence", news agency PTI reported quoting unnamed sources. Justice Arumughaswamy's counsel Mohammed Jafarullah Khan has sought his permission to implead Mr Radhakrishnan and Mr Rao as respondents in the investigation. The counsel said both the officers made contradictory statements before the one-man commission. Mr Radhakrishnan denied the allegations as "unfounded, baseless and wild", adding he has not got a copy of the petition filed by the commission's counsel. The allegation that he "conspired and colluded" with Apollo Hospitals and acted like its spokesperson was "not only false, but also slanderous", the officer said. "Whether to take her or not to a foreign destination for treatment was purely a medical decision for which it would not be correct to hold an officer like me responsible," the former health secretary said, adding he would give his response to the commission on January 4.